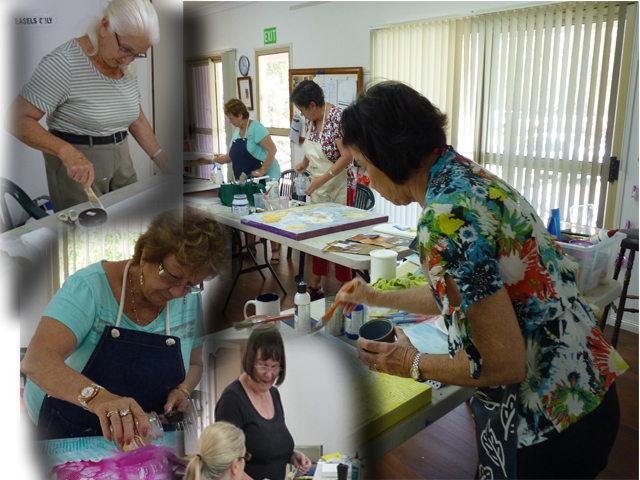 Lots of dedicated work by Clyne, Karen, Joan, Lesley, Gayle, and Adrienne paid off when the 2012 Mixed Media Class mounted their Exhibition at the Yurara Art Gallery. 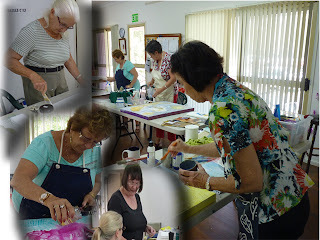 Cathy joined with them to display completed works, which illustrated varied Mixed Media techniques with great success. The show was enjoyed by many visitors, some of whom signed up for classes in the New Year. Redland Art Awards 2012 has run its course. Thanks go to all artists who entered for the high standard of work received. Congratulations to all shortlisted finalists and winners. Thanks also to judges David Burnett, Dr Laini Burton & Emma Bain. David Burnett - Why Does Painting Survive the Digital Age? and make their choices for 1st, 2nd and 3rd places. after the opening night announcement. Turn Waste into Wonderful Artworks! Join Rosie Harvest as she demonstrates how to weave with weeds to turn Waste into Wonderful Artworks. This workshop is an exciting opportunity to get creative with materials sourced from the garden. We will all make our own melon basket with an opportunity to have them displayed in the gallery at a future date. The workshop is limited to 15 participants so early registration is recommended. Cost: $15 + $5 for materials. Bugs on Bookcovers by Rose Sanderson. created by Christopher Jobson, a web designer from Chicago. to showcase on this amazing blog.